The grains are primarily used for human consumption. The whole grains are boiled, roasted, cooked into porridge, ground, baked into flat bread or chapatti. There are glutinous (waxy) and non-glutinous varieties. The flour of glutinous types is used for leavened bread and cakes (as in China) while the flour of other types has to be mixed with wheat flour. Non-glutinous varieties can replace wheat for people intolerant to gluten. In Ethiopia, the grains are fermented into a kind of beverage (tella). Elsewhere they are used for making beer and brandy. The grain is a feed for animals, including ruminants, pigs, poultry and pet birds (Kaume, 2006). However, information about the feed utilization of proso millet grains is limited. Panicum miliaceum has been cultivated in eastern and central Asia for more than 5000 years. It later spread into Europe and has been found in agricultural settlements dating back about 3000 years. Panicum miliaceum is the Roman milium and the true historical millet. It was introduced into North America in the 16th century. Its popularity declined in Europe and the United States after the introduction of the potato and maize. It remains cultivated for human consumption mainly in eastern and central Asia, and to a lesser extent in eastern Europe (Russia, Danube region) and from western Asia to Pakistan and India. Panicum miliaceum is occasionally grown in other parts of Europe and Asia, and in North America, mainly as a source of feed for pet birds and poultry, and as fodder. In Africa, it is cultivated in Ethiopia, eastern Kenya, Malawi, Botswana, Zimbabwe and Madagascar. It is widely naturalized, and is sometimes invasive, e.g. in the United States and Russia (Kaume, 2006). When feeding proso millet grain to livestock it is necessary to grind or process the millet to crack the hard seed coat and break the kernels for a better digestion. Breaking by rolling is difficult. For ruminants, proso millet should be ground coarsely, and a hammer mill with a 6-mm screen produces a satisfactory product. For pigs, a 5-mm screen is recommended (Berglund, 2007; Baltensperger et al., 1995). Panicum miliaceum matures quickly, in 45-100 days. The vegetative phase is usually completed 16-20 days after sowing. From then it takes 20-25 days to flowering of the main culm, but this period is somewhat shorter at higher temperatures. The period from flowering to grain maturity has a duration of about 20-30 days, and is almost constant among cultivars. 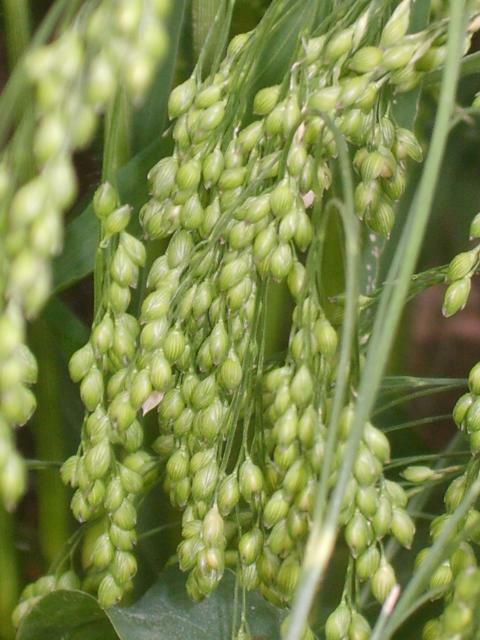 At grain maturity the lower part of the inflorescence as well as the stem and leaves are still green (Kaume, 2006). As a rotation crop, proso millet has the advantage of enhancing weed control, especially with winter annual grasses in winter wheat (Baltensperger et al., 1995). 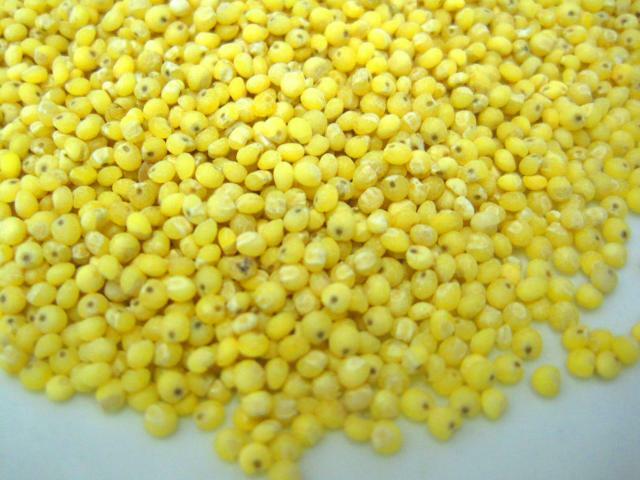 The right time for harvesting proso millet is when the seed has a moisture content of 14-15%. While premature harvesting results in reduced yield and quality, over mature seeds shatter easily. Plants are usually harvested by pulling them up by the roots, and then threshed immediately to avoid grain loss (Kaume, 2006). Seeds in the lower portion of the panicle may still be in the dough stage but should have lost their green tinge (Berglund, 2007). Proso millet is a cereal grain with a higher protein content than maize and sorghum (about 14% vs. 9-10% DM). However, its fibre content is also much higher than that of those grains (ADF 10-14 vs. 3-4% DM). Its amino acid profile is particularly poor in lysine (1.3-2.1% protein vs. 3.1% for maize), which makes amino acid supplementation necessary for monogastric species. Starch content (60-67% DM) is lower than that of maize and wheat but generally higher than that of barley. As a consequence, proso millet is a good energy source for ruminants, but requires adequate supplementation in pigs and poultry. Proso millet contains condensed tannins (0.06-0.26% DM) though less than high-tannin sorghum varieties (Luis et al., 1982a). White varieties contain less tannins than red or brown ones (Lorenz, 1983). Trials in North America and Australia have determined that proso millet has a value roughly similar to that of other major cereal grains for cattle. Dairy cows receiving ground proso millet as 40% of their grain mix produced as much milk and gained slightly more body weight than cows fed equal amounts of oats, maize or barley (Berglund, 2007). Trials in North America found that proso millet, barley, maize and wheat had similar energy values in finishing rations when all cereal grains had similar crude fibre levels. A comparison of proso millet and barley for fattening steer calves showed similar daily gains and feed efficiencies. Proso millet could replace up to half the maize in high-grain diets without reducing gain or feed conversion. Proso millet replacing up to 28% of the sorghum grain in a finishing steer diet improved daily gain. Cattle starting on a diet containing only proso millet took longer to reach full feed than calves starting on oats. Using a small amount of hay (0.5 to 1 kg) also helped cattle consuming large amounts of proso millet (Berglund, 2007). In Australia, bullocks fed on finishing diets containing 90% grain from wheat or proso millet had similar feed efficiencies and carcass weights, and feed efficiency was slightly higher for those receiving sorghum. There were no significant differences in carcass characteristics for the three grains (Gartner et al., 1975). Proso millet is less palatable than maize for lambs and might best be combined with another grain. Various experiments in the United States have shown that proso millet equals maize, barley and wheat for fattening lambs. Coarse grinding is necessary for best lamb performance (Berglund, 2007). Proso millet is deficient in lysine and its low-quality protein is the primary nutritional limitation of this grain for pigs. Early trials in the United States showed that pigs performed better on 1:1 mixtures of proso-barley or proso-maize than on full proso millet diets. Pigs receiving only proso millet ate less per day, gained more slowly and had a lower feed efficiency. Proso millet grain should be supplemented with lysine when fed to pigs and proso millet-fed pigs perform similarly to those fed other balanced cereal grain rations when the protein deficiency is corrected. To keep the level of lysine supplementation moderate, barley is probably the best cereal grain to blend with proso millet. Proso millet-oat combinations are undesirably high in fibre for growing-finishing pigs (Berglund, 2007). Feeding proso millet grain to broilers, turkeys and laying hens can result in performances similar to that obtained with maize or sorghum. However, the diet must contain adequate levels of protein and be correctly supplemented with lysine and methionine. When proso millet, sorghum and maize grains were fed at a dietary level of 70% in broiler diets that contained suboptimal protein, the millet and sorghum diets without amino acid supplementation significantly depressed weight gain and feed efficiency at 4 weeks of age. This detrimental effect was corrected by methionine and lysine supplementation, with chicks fed proso millet and sorghum diets showing the greatest improvements. When the proso millet was compared to sorghum and maize on an equal weight or a protein equivalent basis in broiler diets with adequate protein (22.5%), there were no significant differences in body weight gain or feed efficiency (Luis et al., 1982a). In comparison trials between proso millet, maize and sorghum, hens and pullets fed whole proso millet diets (70% inclusion rate) showed slight depressions in egg production but tended to lay larger eggs. Pullets fed millet diet had body weight gains similar to those fed the maize diet, but slightly greater than pullets fed the sorghum diet. Proso millet gave yolk color scores significantly greater than sorghum but less than maize grain. The specific gravity of eggs from pullets did not differ greatly among diets (Luis et al., 1982c). In layer diets, the replacement of 50 to 100% of maize grain (55% dietary level) by proso millet decreased egg production (from 4.08 to 2.72 eggs per week), feed efficiency and ß-carotene content, but other egg quality traits (such as egg weight, shape index, albumen index, yolk index, Haugh units, egg shell thickness) were not affected (Korane et al., 1991; Korane et al., 1992). When proso millet was compared to maize or sorghum on an equal weight or a protein equivalent basis in turkey starter diets, containing optimal protein and with adequate supplemental methionine, there were no significant differences among grains relative to body weight gain and feed efficiency. In turkey starter diets containing adequate protein with supplemental methionine and lysine, young turkeys fed the proso millet diets were significantly heavier than those fed maize or sorghum diets at 28 days of age. Poults fed proso millet with no methionine supplementation showed significant depressions in body weight gain but not in feed efficiency (Luis et al., 1982b). Millet for bird food is often grown under contract. Large, bright white or red seed is preferred and premiums are occasionally paid for superior quality. Two types of bird seed mixes are marketed, one for wild birds and the other for cage birds. 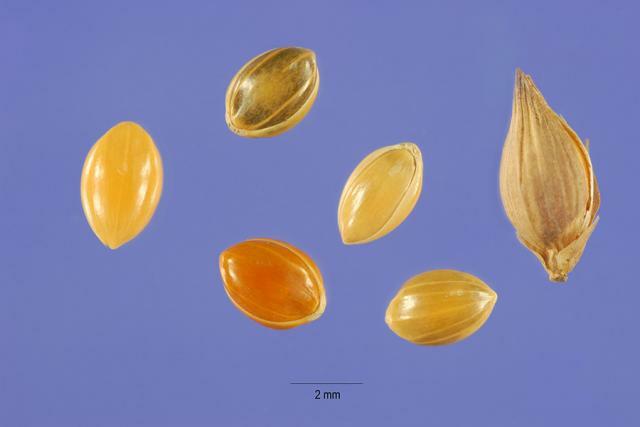 The cage bird mixes require the better quality proso millet and premiums are often paid to obtain this type of seed (Berglund, 2007).